It is perhaps one of those strange ironies that London, one of the great brewing capitals of the world, can boast so few actual breweries! As the founding home of such world renowned beer styles as IPA , Porter and Stout , London today can only claim one regional sized brewery as its own. Long gone to are the bigger breweries who have also ironically fallen foul of global influences and intentions - becoming powerless the stop the inevitable, in the constant flux of buy outs and mergers. Out of what seems like a mildly apocalyptic scenario has stepped forward a number of individuals who are attempting to redress the balance! The re- emergence of the micro-brewer in London, especially within the last five years, has been a positive and exciting reaction to the lack of choice in the capital. 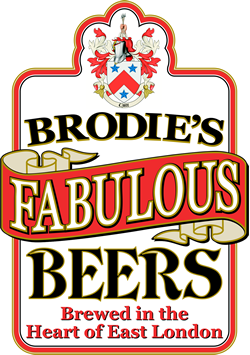 One such individual in this new movement for change is James Brodie, and on a recent visit to the aptly named Brodie's Brewery in Leyton I was able to talk with James and see more. It was nice to see ( in the time honoured tradition! ) the small brew house that supplies the King William IV pub literally a stones throw away next door. Space is naturally at a premium and as James explained they are in the throws of re-jigging the layout. ' I took over the defunct brewery in June 2008 and we were up and running with our first brew in December ' . As many micro-brewers will contest brewing can be a fickle mistress and as James acknowledged ' Beer is organic, a living product ' so slight variations between brews is part and parcel of real ale, and its appeal. To date variety ( and innovation ) has been the spice of life in terms of styles, with many 'exotic' and 'traditional' brews coming from the mash tun. The King William gives the brewery a permanent and important outlet for these in draught form, which can allow for experimentation, whilst several have found there way into bottled form. On the shelves of the King William was an impressive array of some twelve bottles styles ranging from such curious delights as Pink Pride through to Choc Chip Mint Stout! When I asked James about the current availability in the retail trade for the bottles he acknowledged it was a new area for them. ' At the moment we keep the bottles close to home ' which makes sense with any new venture, and importantly to monitor quality. Having tried a small selection from the range three beers stood out, one in the 'exotic' mode and two in the 'traditional'. The first was the Pink Pride at 3.4% alc. The beer had a heady aroma of summer fruits with nectarine and citrus aromas that were fresh and inviting. On the palate there were suggestions of peach with an underlying hint of some dark berried fruits mixed within. The brew was very well balanced with a subtle carbonation following through, and its flavour suggested a slightly higher strength. I was later to discover that the flavouring was 'raspberry' and very good it was too! An excellent summer brew and impressive. The second which was in the 'traditional' style was the London Porter at 7.8% alc! This really does fit the bill in terms of strength, but more importantly was the flavour itself. A deep aroma of dark malt with a touch of vanilla was followed by a powerfully flavoured brew with of hints of roasted malt and coffee notes. The palate was rounded, and impressively fresh again on the palate. A classic interpretation of the style. It was good and somehow heart warming to see brewing up and running again in a part of East London that is not a million miles away from where the classic Porters and Stouts begun their lives, and consequently changed the brewing world forever. James and his team clearly have the will to experiment and push the boundaries of flavour to new unexplored levels for the great British public's drinking pleasure, and show they can do it to good effect! Long may their success continue and - Capital Drinking !